This show is set at Honn0ji Academy, a fictional high school in post-apocalyptic Japan that is dominated by its fearsome student council, led by Satsuki Kiryuin. The council members wear special uniforms called Goku Uniforms that grant them superhuman abilities, which they use to oppress the rest of the school's students and staff. Ryuko Matoi, a student wielding a scissor-shaped longsword, transfers to Honnoji Academy in search of the scissor blade's original owner, who killed her father. 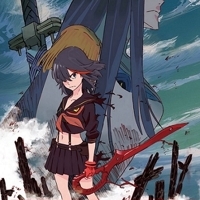 Defeated by the council after interrogating Satsuki over the killer's identity and whereabouts, Ryuko comes across a sentient sailor uniform named Senketsu, who puts himself on Ryoko. Using Senketsu's special abilities, Ryuko stands up against Satsuki and her henchmen, the Four Elites, to liberate Honnoji Academy from their iron grip and find out the truth behind her father's murder. 6170 users rated Kill la Kill [TV]. Return to Kill la Kill.